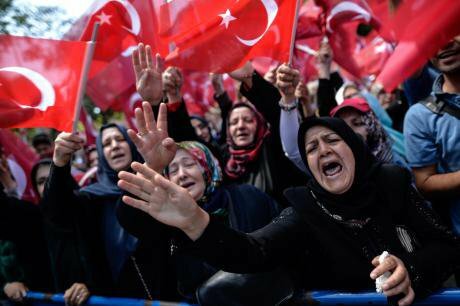 A group of AKP party supporters protest the attempted military coup against the Turkish government, allegedly supported by the cleric Fethullah Gülen and his organisation. Saracahane Park, Istanbul, July 2016. Photo (c) Depo Photos/ABACA/PA Images. All rights reserved. The abduction of Mukhtarli shattered Georgia’s image as a safe haven for dissidents from neighbouring countries, and prompted many Georgians to consider the extent of oil-rich Azerbaijan’s political clout. With Turkey sliding ever further into authoritarianism, is there another headache on the horizon for the Georgian authorities? At the order of president Recep Tayyip Erdoğan, Turkish officials and diplomats have made appeals worldwide calling on governments to close down Gülen schools abroad. The Turkish government insists that this network of schools poses a national security threat, and has classified the Gülen network as a terrorist group. FETÖ, as the Turkish government calls the Gülen movement’s “terrorist network”, is accused of plotting last year’s failed coup on 15 July. Calling the events a “a gift from God,” Erdoğan promised that those responsible would “pay a heavy price.” Those who feared the coup would provide a pretext to crack down on all dissident have been proved right. Not only Gülen followers, but Turkish liberals, secular democrats and journalists have been arrested, with many more tortured in detention and fired from their jobs. Over the months following the coup, Turkey has arrested more than 40,000 people and sacked or suspended more than 100,000 in the military, civil service and private sector. Turkish nationals working in Gülen-affiliated schools worldwide now fear repatriation and prefer either to apply for a political asylum in their host country or to try their luck in the EU or USA. Çabuk has found himself in a similar situation. In 2007, he started work as director of the Niko Nikoladze High School in Kutaisi, western Georgia. From 2012 until 2016, Çabuk served as deputy general director of all Gülen schools in Georgia. 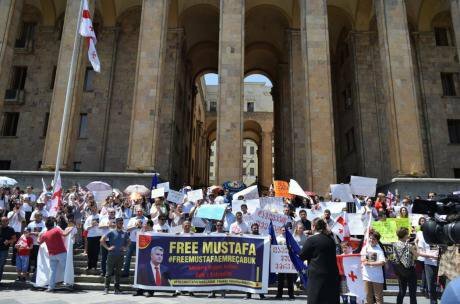 Protest in solidarity with Mustafa Çabuk on Rustaveli Avenue, Tbilisi, 7 June 2017. Photo (c): Luka Pertaia / OC Media. All rights reserved. On 24 May, the Georgian authorities launched an extradition procedure against Çabuk at the official request of Turkey. According to information provided by the Turkish prosecutor, Çabuk is wanted for committing a crime as defined by Article 314/2 of Turkey’s Criminal Code: membership of the FETÖ terrorist organisation (recognised as such only by Turkey). 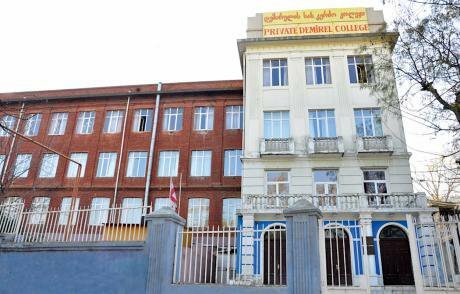 Information obtained by openDemocracy shows that he, with the permission of the directors, wanted to sell 60% of shares of the Tbilisi-based Demirel private school to Metropolitan Education and Consultation Services, a company registered in the USA. The documentation that supposedly incriminates Çabuk mostly describes the activities of the Gülen movement in Turkey. It does not specify why either Çabuk’s role at the school or his deal with the American company on its behalf constitute a link to terrorist activities and organisations. “Precisely for these reasons, we believe that the charges are entirely unsubstantiated and politically motivated,” concludes Tamta Mikeladze, civil and political rights program director at Tbilisi’s Human Rights Education and Monitoring Centre. Çabuk was detained shortly after Turkish prime minister Binali Yıldırım paid a visit to Tbilisi to meet his Georgian counterpart Giorgi Kvirikashvili in May. On 25 May, Tbilisi City Court sentenced Çabuk to three months’ imprisonment, pending extradition. “He’s been in prison for more than a month, and the charge is both scary and ridiculous," says Çabuk’s wife, Tuğba, who adds she still has faith in Georgia’s commitment to democracy. “Georgia is a country that is at the door of the democratic European Union rather than one where democracy has already seen its end.” She has publicly called for the Georgian government not to bow to pressure from Ankara, and has herself requested protection from the Georgian authorities, fearing reprisals. Demirel College in the Georgian capital of Tbilisi, where Mustafa Çabuk worked as a manager and teacher. Photo CC: WikiMapia. Some rights reserved. This kind of political bargaining is common between Turkey and South Caucasus states. After all, Gülen schools were welcomed throughout the region from the early 1990s. With the fall of the Iron Curtain, Georgia became the first country that welcomed representatives of Gülen’s movement, though the Azerbaijani city of Nakhchivan was the first place outside Turkey to host a Gülen-affiliated school. Until the purge, some 13 Gülen-funded schools and the now nationalised Qafqaz University functioned in Azerbaijan. The movement’s schools now operate in 160 countries worldwide. After Turkey’s AKP government restored its power following last year’s coup, Ankara initiated a purge against all Gülen followers in the Caucasus and Central Asia. As a strongly authoritarian state and long-time ally of Turkey, Azerbaijan was only too eager to oblige — Baku’s solution was to nationalise the schools. The attitude of the Central Asian republics, with whom Turkey has maintained strong economic and political ties since their independence, was far from united. Kazakhstan and Kyrgyzstan pushed back against the Turkish demand to pursue Gülenists. Turkmenistan played ball, launching a massive crackdown against all followers of Gülen in the country, while Uzbekistan never welcomed the Turkish schools in the first place. Tajikistan closed the last of its Gülen schools in 2015, though that could be explained as part of a wider campaign against all Islamic groups in the country. It seems clear that Ankara has already put enormous pressure on Tbilisi to close Gülenist schools and deport Turks working at them. Azerbaijani journalist Mahir Zeynalov, chief editor of the Globe Post who was deported from Turkey for a tweet critical of Erdoğan in 2014, echoes Badridze’s view. Zeynalov stresses that it’s difficult for Georgia to ignore demands from Turkey, its largest friendly neighbour and the country’s second largest trading partner after the EU. Turkish money has flowed into a series of infrastructure projects in Georgia, and is particularly influential in the western province of Ajara. The Georgian Young Lawyers’ Association has monitored Çabuk’s case and believes that the court ruling for a provisional arrest falls short of the standards established under the Georgian legislation and the European Convention. 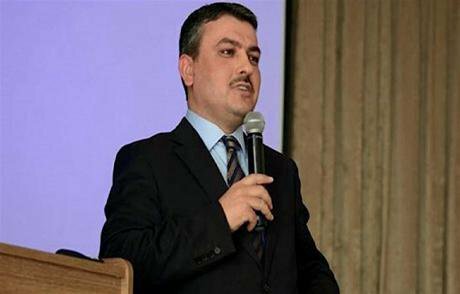 The prosecutor declared that Çabuk could otherwise flee the country and continue his “criminal activities”, but did not give any grounds for these fears. “The court’s decision is not well-founded,” says Vakhtang Kvizhinadze, Çabuk’s lawyer, adding that his appeal against it was in vain. The decision was kept in force despite the fact that Çabuk has lived in Georgia for years and has a residency permit. “Mustafa did not evade any of his obligations before the court,” Kvizhinadze says. According to his wife, when the police came to arrest Çabuk on the morning of 24 May, they informed him that the Georgian authorities had no problem with him, but that his arrest was requested by Turkey. “We didn’t even go to Turkey for 17 months, but now my husband is blamed for terrorist activities and a coup attempt,” sighs Tuğba Çabuk. Good neighbours on the Black Sea. 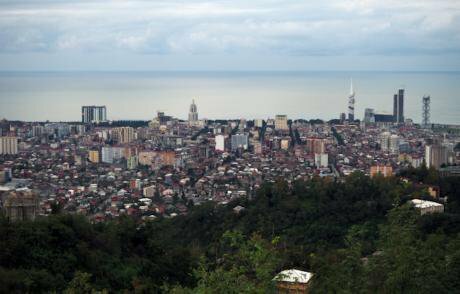 Batumi, capital of Georgia’s autonomous region of Ajara, which is heavily dependent on Turkish investment. As one of Georgia’s largest trading partners, Turkey is involved in several large infrastructure projects, from airports to dams and railways. Photo (c): Alexander Chichurin / RIA Novosti. All rights reserved. Georgian legislation allows the courts to imprison somebody wanted by foreign law enforcement agencies, but only as a last resort and never as a punitive method. Çabuk could have been released on bail after handing over his passport and a cash payment of bail of GEL 10,000 (£3,248). When he tried, the court refused. Sozar Subari, Georgia's Minister for IDPs, accommodation and refugees, stated on 7 June that Çabuk cannot immediately be deported to Turkey simply upon Ankara’s say so, and that a number of documents would be required before extradition was possible. Meanwhile, Amnesty International has started a campaign in Çabuk’s defence. Under Article 28 of the Law of Georgia on International Cooperation in Criminal Matters, Georgia has the right to refuse an extradition if the crime concerned has been fully or partially committed on the country’s territory, as was Çabuk’s alleged crime concerning the Demirel school. Article 35 of the Treaty between Georgia and Turkey on mutual legal assistance in civil, trade and criminal matters states much the same. “I’m not sure how eager the Georgian government is to hand Çabuk over to the Turkish authorities, particularly given how the Mukhtarli scandal damaged Georgia's international reputation,” says Badridze, who hopes that the court’s final decision will be guided by legal considerations and not by politics. Çabuk’s colleague Taci Şentürk, a manager at the Turkish Istek school in Baku, was detained on 7 June. Once he was able to call his family, Şentürk told his spouse Fatma that he was to be sent to Turkey. He proposed that his family come to the airport to meet for the last time. “The policemen did not let my husband give one last kiss to our kids, nor could our lawyer meet him," Fatma Şentürk told me, adding that the only reason they were given was the sudden invalidation of Taci’s passport. The Şentürks’ residency permit in Azerbaijan was due to expire on 7 September this year. There is no official information as to why Taci’s passport was invalidated, despite his having the right of residency in Azerbaijan. The question must now be raised how Taci Şentürk was supposed to have entered Turkey without a valid travel document. Just 20 minutes before takeoff, Fatma says, a representative of the UN office in Baku arrived and demanded that Taci Şentürk be removed from the plane on the grounds that he and his family were now under the protection of UNHCR’s Baku Office. But after Şentürk was taken off the plane, the representative did not accompany him home. “Police were waiting for him at the airport terminal, and returned him to their organised crime department,” adds Fatma. “Despite my insistence that Taci might be sent to Turkey, the UN delegation couldn’t do anything,” says Fatma Şentürk. Her husband was eventually sent to Turkey on 8 June. Şentürk is now being interrogated in Turkey’s directorate for combatting smuggling and organised crime in Konya. Taci Şentürk. A Turkish teacher working in Azerbaijan’s capital, Şentürk’s deportation to was stopped at the last minute by UN officials, though it is believed he has been extradited to Turkey regardless. Photo courtesy of the Stockholm Centre for Freedom. All rights reserved. Independent lawyer Samed Rahimli, who will bring Taci Şentürk’s case to the European Court of Human Rights, says that Şentürk’s case is remarkable — he was extradited to Turkey without any legal procedure. “UN protection was completely ignored by the Azerbaijani authorities,” says Rahimli. Şentürk is not the first Turkish national who was deported from Azerbaijan in this manner. On 6 June, Muharrem Menekşe, a member of the Gülen movement, was sent to Istanbul without any legal grounds. Menekşe had lived in Baku since the early 1990s, where he ran a small business. Rahimli adds that there was no official charge or formal process from the Turkish authorities in either case: “Ankara just gave the order, and Azerbaijan executed it.” A similar fate befell the Azerbaijani opposition journalist Rauf Mirgadirov, who was deported to Azerbaijan from Turkey, where he lived and worked, in 2014. There was no formal charge from the Turkish authorities in either the Şentürk or Menekşe’s deportation: Ankara just gave the order, and Azerbaijan executed it. “Erdogan and Aliyev have long rode roughshod over the laws because of their own interests,” says Ulvi Hasanli, a board member of the N!DA youth movement. “There may be other cases of which we are unaware.” That Ankara and Baku are so prepared to trade favours shows a convergence of regime interests rather than strictly national ones. But it was not always so. Erdoğan’s deteriorating international image as well as his vow to getting rid of his archenemy Gülen has made Azerbaijan and Turkey even closer allies in fighting dissent. In Azerbaijan, few people appear to care about Taci Şentürk’s fate. When I approached Baku residents, almost none of them knew of Taci Şentürk. Most were surprised to hear about the deportation of a Turkish national; as Azerbaijanis and Turks share many cultural ties, mistreating a Turkish citizen could be considered shameful by Azerbaijanis. The ruling on whether Çabuk will receive political asylum in Georgia will be made on Friday — the extradition process has been put on hold while his asylum application is being considered. The ultimate decision on whether he will be deported to Turkey to face (in)justice will be made in a final trial to be held after 24 August, after his three months’ detention comes to an end. Between 2007 and 2016, Ankara made almost 399 extradition requests to western European countries, though only 11 have been granted (including nine by EU Member States). These include requests for the extradition of 59 participants in the coup attempt of 15 July. Germany has refused to expel 22 individuals linked with Gülen. In Greece, civil society protest over Turkey’s extradition bid request led to a Supreme Court ruling against it. Wealthy and influential western European countries can afford to reject extradition requests made by the Turkish government. But Azerbaijan and Georgia probably cannot. Neither wants to harm their relationship with Turkey, which is an important corridor to the west and regional counterbalance against Russia. Ankara’s hunt for Gülen may prove a test of how the two states can defend their sovereignty. That is, if they’re interested.